A team of researchers including electrical engineering professor Holger Schmidt and UC Santa Cruz graduate students Alexandra Stambaugh and Gopikrishnan Meena recently published their research on dual on-chip detection of Zika virus biomarkers in Biomedical Optics Express. The article, Optofluidic detection of Zika nucleic acid and protein biomarkers using multimode interference multiplexing, was selected by the publication as Editor’s Pick for its excellent scientific quality. The paper describes the research team’s design and implementation of an optofluidic method that detects multiple types of molecular targets simultaneously. The method involves placing samples of the virus onto an optofluidic chip with a solid-core optical waveguide that intersects a liquid-core waveguide containing the target molecules. The solid-core waveguide is designed to create a different number of light spots in the fluidic channel depending on the excitation color. This can be used to identify biomarkers if they are tagged with different fluorescent markers. 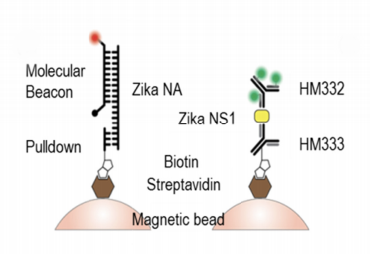 The team successfully detected Zika virus nucleic acid and protein biomarkers simultaneously using this method. The detection of both biomarkers is crucial to the accurate diagnosis of patients with Zika, a virus that is difficult to detect due to it’s cross-reactivity with Dengue virus and the fact that Zika nucleic acid and antibody biomarkers cannot be detected at the same stage of infection. The results of this research will enable more accurate diagnoses other diseases as well. “The ability to detect different biomarkers is critical for developing a broadly applicable diagnostic instrument. For example, nucleic acid and protein biomarkers are important for infectious disease detection and monitoring cancer immunotherapy,” Schmidt said. “Eventually, we want to use this approach for both lab diagnostics and point-of-care applications, which would be great for developing countries,” explained Alexandra Stambaugh, first author of the research paper.